“Dort, wo du nicht bist, dort ist das Glück.” (Where you are not, that is where happiness lies) – This sentence comes at the end of one of Franz Schubert’s most famous songs, “Der Wanderer” (D493) from 1816. “I am a stranger everywhere,” confesses the man who descends from the mountains and, arriving at the seashore, breaks into song. No solemn occasion. No singer breathing tremulously beneath a tight shirt- front. No fear of a tickly cough. And no fear that later you might disgrace yourself with one wrong or embarrassing phrase. No programme – just the music of Franz Peter Schubert. You will be familiar with these tense situations at lieder evenings and chamber concerts. Five hundred, sometimes a thousand, people sitting in narrow, serried ranks, all making a Herculean effort to achieve a state of inner contemplation. Great art is always mixed with torment. 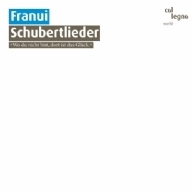 Franui’s Schubert interpretations are a liberating blow. They liberate the songs of the young composer from almost two hundred years of captivity, during which time they have come under scrutiny with unhappy severity from an ever-changing coterie of connoisseurs. Schubertlieder is both a première and a look back ... further back than you might think. Franui do not just revisit Schubert’s life-time, they dig deep into the soil from which his material, his fantasies, were formed. Of course, there are echoes of the Heurigenlieder to be heard. One senses the frenetic violins, which were such a source of fascination for him on Count Esterházy’s estate in Zselíz. But then there’s also the creaking of the floorboards that alarmed him so much in the darkness, the child’s fearful look at the moon, while the clock chimed in the parlour. Franui is the name of a mountain pasture in the small Austrian (East tyrol) village of innervillgraten (1402 m above sea level), where most of the musi- cians grew up. e highlights of the Musicbanda’s work − they have been going since 1993 − were the song-play “Steine und Herzen” (Stones and Hearts), which was pre- miered at the 2005 Ruhrtriennale in duisburg’s Kra zentrale (libretto and direction: Sven-Eric Bechtolf) and also the music and image theatre project “wo du nicht bist” (2006), for which these Schubert lieder were originally composed (→ page 24). e double cd “Ende vom lied”, which rst appeared in 2004 was awarded the German record critics’ prize. The title says it all. „Wo du nicht bist, dort ist das Glück“ – the last sentence of Franz Schuberts „Der Wanderer“ (1816) has never been more stunning than backened by the 17 Schubertlieder adapted by Franui. The original is celebrated, stripped down to its bare bones, enhanced, painted over, elaborated - the outcome is unmistakeable Franui. In celebration of their 20th anniversary, Franui released this Vinyl-LP in 2013 containing pearls from their early years as well as few of their current hits. Truly recommended!